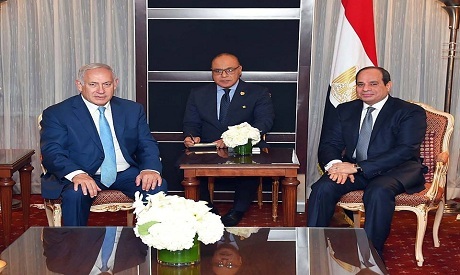 Egyptian Preident Abdel Fattah El-Sisi met with Israeli Prime Minister Benjamin Netanyahu in New York on Thursday to discuss efforts to revive the Middle East peace process, a presidential spokesman said. During the talks, El-Sisi stressed the "importance of resuming negotiations between the Palestinian and Israeli sides with a view to reaching a just and comprehensive solution to the Palestinian issue based on the two-state solution and relevant international reference points," El-Sisi's spokesman Bassam Rady said in a statement. El-Sisi added that a final and just settlement of the Palestinian issue will guarantee "stability, security and development" in the Middle East. The two met on the sidelines of the United Nations General Assembly in New York. Peace talks between Israel and the Palestinians have been stalled for several years and Israeli settlements in the occupied territories, where the Palestinians hope to establish an independent state, have expanded. Egypt, longtime mediator in Israeli-Palestinian peace efforts, has condemned the deaths of Palestinians and President El-Sisi had earlier said that the move of the US Embassy in Israel to Jerusalem will cause “some instability” in the region. Egypt was the first Arab country to forge a peace treaty with Israel in 199 under the US-sponsored Camp David accord. Netanyahu and El-Sisi met in public for the first time in September 2017 also in New York, ahead of the annual UN General Assembly.